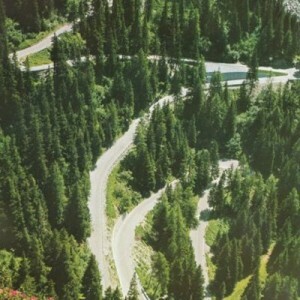 Maloja Pass (Italian: Passo del Maloja, German: Malojapass) (el. 1815 m.) is a high mountain pass in the Swiss Alps in the canton of Graubünden, linking the Engadin with the Val Bregaglia and Chiavenna in Italy. It marks the watershed between the Danube and Po basins. 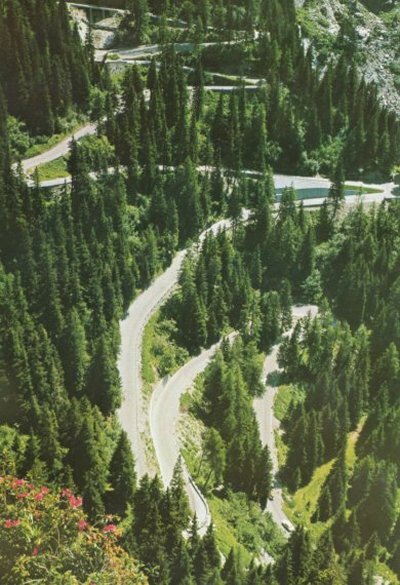 “The Maloja Pass was part of an important Alpine crossing at the times of the Romans and led by Comum (Como) via the Maloja Pass, the Julier pass to the Rhine Valley to Chur and through Brigantium (Bregenz) towards Augusta Vindelicum (Augsburg). It is documented since the 16th century as a hiking transportation pass and was finally upgraded in 1839 to a driveway, used by wooden barrows. The Maloja Pass is therefore strictly spoken only a half of a pass, since the other side of it just continues from its 1,800m level more with a gentle slope to the Engadine. The pass itself covers, coming up from the Bergell, up to 400m on altitude. We start in Chiavenna with its original Italian flair at 325m altitude and follow the road east through the Val Bregaglia (Bergell) valley, on the left side of the small river Mera. Shortly after Chiavenna, we have already reached 697m altitude when we come across the little town Castasegna and the Swiss – Italian border. The road formerly led through Castasegn, a single lane and was controlled by a traffic light. In the meanwhile, this bottleneck was fixed by a ring road. But a short detour to the village is always worthwhile.